As most of you will know by now there has been a change of top management at Atari in the UK with Bob Gleadow appointed as UK Managing Director and another ex-commodore man as Sales Manager. Bob Gleadow was the man who was strongly rumoured to be taking over in the UK when Jack Tramiel bought Atari but it never happened and, as we all know, Atari trundled on in much the same way as always. Nobody can seriously claim, despite the presence of the ST, that Atari has achieved the position in the UK that we all hoped for when Jack Tramiel took over. There have been many changes of management over the years at Atari and each time everybody involved with supporting Atari has thought 'Is this it? Are we now going to see some real advertising and a push to get Atari into its rightful place in the UK?. It never has happened and those who have been selling and supporting Atari over the past four or five years have tended to become a little jaded. Will it happen this time? Who knows, but early signs are encouraging. Atari were initially not going to attend the recent Atari Christmas Show but changed their minds when Bob Gleadow took over and we actually received a phone call from someone at Atari offering 'encouragement' and wanting to know more about us. Just past our fourth birthday and someone at the top of Atari knows we exist! It is evident that this new man wants to know what is going on in the Atari world and is anxious to find out what support there is which is the first step to success. Let us hope this time that this really is it. Okay 1029 printer owners, this is the issue you have been waiting for. 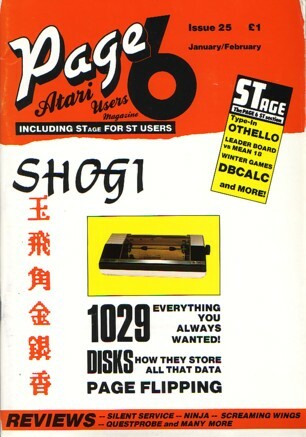 I have mentioned before that we had some material for the 1029 and I had planned to run it over several issues but have decided instead to put all the most useful items in this one issue for easy reference. I was going to do a long article on the 1029 myself but having got hold of one it has to be acknowledged that it is a very basic printer, and quite honestly the manual does cover everything the printer can do. All it needs is someone with a little programming experience to expand upon the manual. Here you have it. Turn to the section on the 1029 and enjoy! As we now are able to pay for most of our contributions I had thought about dropping the Readers Poll but it has proved invaluable in the past to see what you are interested in and can always double as a survey. Instead of the usual prizes for winning contributors we will this year present the winners with a handsome trophy in recognition of the thanks given by the readers. Maybe next year we will extend the idea a little to have an annual PAGE 6 Awards ceremony for everyone who has supported Atari? For now, please vote and please also use the survey to let us now what you would like to see in the magazine. Tell us about the areas you feel we have not yet covered and we will do our best to bring them to you. Following on from the above, I need to make my occasional plea for more contributions, especially of programs. We are running short of top class programs of all kinds but particularly games. There must be more out there just dying to get into print so please send them in. The more documentation and written detail you can provide the better the chance of being accepted, but don't let lack of documentation stop you, send them in anyway! We have had a few problems coping with everything during the last year, what with three exhibitions, moving offices and a lot more besides and some contributors have not had their submissions acknowledged. For that I apologise but I crave your understanding and hope that you will keep them coming. We have now got ourselves straightened out now and things will improve. I promise! Only if you send in some great programs and articles though!